Authentic Images, starting with Andy Warhol? When the kids saw me and Edie walk in, they started actually screaming. I couldn’t believe it – one day you’re in an art gallery in Toronto and not one person comes in all day to see you, and then suddenly there are people who get hysterical at the sight of you. It was so crazy. Older people in evening gowns were next to kids in jeans. They had to lead us through the crowd – the only place we wouldn’t get mobbed was on some iron stairs that led up to a sealed off door….We were on those steps for at least two whole hours. People were passing things up to be autographed – shopping bags, candy wrappers, address books, train tickets, soup cans. I signed some things but Edie was signing most of them “Andy Warhol” herself. There was no way to leave – we knew we’d be mobbed as soon as we came down. Finally the officials ordered the fire department to break through the sealed off door behind us with crowbars, and we were led out that way, through a library, onto the roof, over an adjoining building, down a fire escape, and into waiting police cars. Now things were getting really interesting. 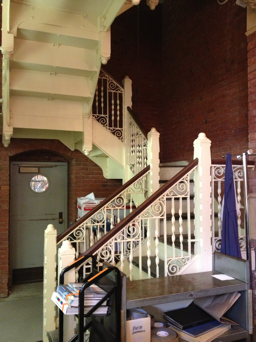 Here are then-and-now photos to enjoy – of the stairs Warhol described – located right behind the circulation desk of the Fine Arts Library. A photo of the actual scene is one of many treasures in the Fine Arts Library Image Collection, which could be an ideal source of images for your next project. Warhol, Andy. POPism: the Warhol ’60s. New York: Harper & Row, 1983, c1980. pp.132-133.